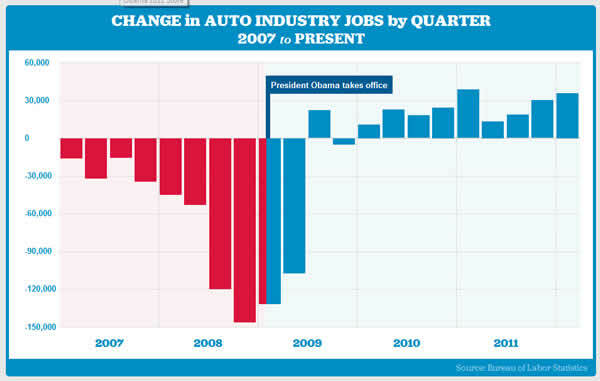 As the 2012 election approaches, there will be much talk on both sides regarding the Obama administration’s role in saving the American automotive industry. You don’t have to take the Obama administration’s word for this, The Economist (initially against government help for the auto industry) has since issued an apology. And GM is once again the largest auto maker in the world. 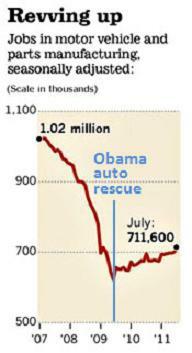 First, here are a few charts which show a clear correlation between the Obama administration’s actions and activity in the auto industry. Because the above fact looks good for the Obama campaign, it looks bad on Republicans, especially Mitt Romney who suggested allowing Detroit to go bankrupt. So Republicans have a list of “reasons” why the auto bailouts were still a bad idea. I have organized them below and provided responses to them. 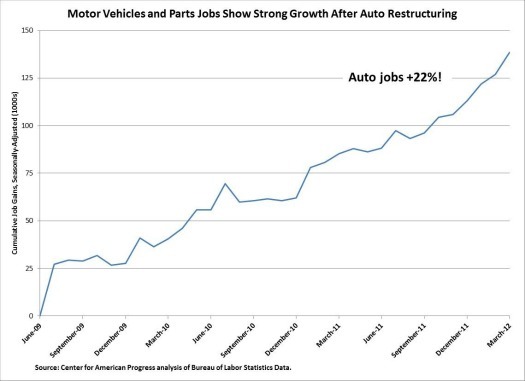 GM and Chrysler going under would have resulted in the loss of not only GM and Chrysler jobs, but the jobs of many industry-related workers (think automotive supply, fabrication, aftermarket, etc). The result would likely have been hundreds of thousands, possibly millions of job losses that would have further depressed non-automotive related industries (ie. retail and aftermarket companies where newly unemployed automotive or closely-related workers would no longer be spending their money). Knowing that GM’s bankruptcy would have a domino effect that would affect auto suppliers throughout the supply chain, Toyota and Honda agreed that GM should be bailed oit. The argument here is that GM and Chrysler should have been allowed to fail because their predicament was a result of their own market-related failures. Keeping these dysfunctional companies around is bad for the economy in general because it rewards failure and amounts to picking winners and losers. While it’s clear that GM and the other major automotive companies made some bad decisions in the past that led to a less-then-ideal position in the market, what drove them over the edge were events they had no control over. The near meltdown of the financial markets meant loans became more difficult for everyday people to get. And vehicle sales depend on loans. In other words, the downturn in automotive sales happened, not because GM made bad decisions, but because the loans became harder to come by, which made it more difficult to sell cars. The downturn also affected Toyota, which also received a small bailout from the Japanese government. Furthermore, the argument that bailing out of even subsidizing an auto maker is tantamount to picking winners and losers ignores one basic fact: GM’s Japanese counterparts receive subsidies from their government. This is a common practice and many self proclaimed fans of the free market seem to overlook. While this sounds superficially plausible, the math doesn’t add up. Politically, this was a very unpopular move. Already angry over the bank bailouts, people were not happy with the prospect of bailing out more companies. According to a Gallup poll taken at the time, 72% of those polled were against bailouts, and only 25% were in favor. This was not a party-based decision either. It was nearly as unpopular with Democrats as it was with Republicans. Against these numbers, any argument that this was a ploy for support from a few hundred thousand United Auto Worker’s Unions makes no sense, given the tens of millions of people who were clearly against this. According to Mitt Romney, this deal “handed” GM over to the UAW. He is most likely referring to the fact that UAW workers now have more of a stake in the company through the UAW Retiree Medical Benefits Trust, (not the UAW itself). Mitt Romney’s past in private equity may very well result in him being against employees owning a stake in the company. But no one is more interested in the long term health and growth of a company than its employees, who depend on their company for a pay check (especially companies where employees expect to retire from). This is in stark contrast to many private equity investors who can (and do) only look for short term profits and in doing so, may gut a company’s long term production capabilities for a short term gain. A company’s health 5-10 years down the road many not be of concern to this class of investor who will likely be on to the next company by the time structural deficiencies or straddled debt from leveraged buyouts catch up to it. What’s more is this: Union employee health care (one of the reasons GM has had trouble when it comes to employee costs) is now the responsibility of the UAW, not GM. In other words, this placed a net burden on the UAW and shifted it away from GM. This hardly amounts to a handout. Mitt Romney suggested a private sector purchase, which wouldn’t have worked. Prior to the government’s purchase, a private sector buyer was sought after. None were found. During a time of economic downturn, the private sector is holding onto cash, not looking to invest (especially in an industry where sales have been greatly reduced–for example, the auto industry). In fact, one of the buyers that was unsuccessfully courted was Mitt Romney’s old private equity firm, Bain Capital. Bain passed on this opportunity. This may or may not be true depending on the “X” amount critics cite. The “bail out” encompassed both a $6 billion loan (which has been paid back with interest) as well as about a $40 billion purchase for 61% ownership by the Treasury Department. Whether the latter portion of the bailout will result in a net gain or loss will depend on what sales of GM’s shares are when the Treasury department sells them. At this point in time, it would indeed be a net loss. But it this ‘loss’ would be far less than the total “bailout” amount. One more thing, the figures above only take into account the money that directly invested and received by the Treasury. What it doesn’t factor in is any money saved on unemployment insurance, or the tax revenues that would have been lost by an economy that would have been further depressed by the loss of hundreds of thousands, possibly millions of automotive-related jobs. According to this argument, in times like this, the market will provide a buyer (or group thereof) who will purchase companies (or their assets) and put them to use. This is unfortunately, not what happens during an economic downturn. An economy in full recession and with vehicle sales at an all-time low doesn’t exactly encourage other automotive companies to simply buy and begin making use of these plants. At best, whatever assets were deemed worthy would have been auctioned off at below market prices and most if not all of these employees would have been laid off.